My last blog was on the subject of contempt of court following the recent assault on an Ipswich judge. It is instructive to follow this up with some further thoughts, this time about Nelson Mandela. 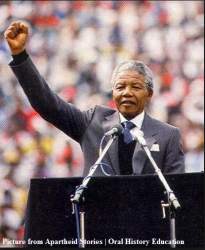 Nelson Mandela will be remembered as a great leader, visionary thinker and statesman. What may not be known so well is that he was firstly a lawyer. He was the only Black African in his class studying law at Witwatersrand University in the 1940s and practised law in the 1950s in partnership with Oliver Tambo. Together they comprised the first Black African law firm. In his book Long Walk to Freedom Mandela wrote that his firm was ‘a place where Africans could find a sympathetic ear or competent ally’. Of course, for a political activist in a country where he and others of his colour were completely excluded from democratic life, his relationship with the law was never going to have been easy, but the importance of the rule of law as a democratic principle continued to pervade his thinking and activity. He vigorously opposed the apartheid laws of course and felt not bound by them. But he also recognised that in a fully democratic state (which of course South Africa was not during the apartheid era) the rule of law must prevail. In an article in the Times this week reference is made to the legal case relating to the death penalty which ran through the South African Constitutional Court when he was President. Whilst opposed to the death penalty he accepted the Court’s final decision that he had acted unconstitutionally in abolishing it at the time, issuing a statement that no person was above the law, including the President. Like post-apartheid South Africa we also have a democracy. It is useful to reflect on the above when considering both the contempt some politicians and even sometimes government ministers seem to have for the law (for instance some human rights decisions) but also at the other end of the scale, when analysing the sentencing for the assault on the Ipswich judge for instance. It helps to understand why the sentence for contempt in that case was nearly as high as that of the Defendant who had committed the original crime. It is also an answer to the opinion of some that the former was not in any way justified.